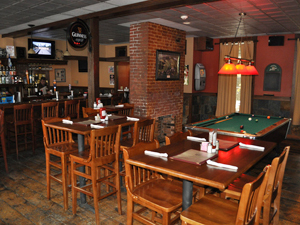 The Olde Heritage tavern has to be one of the most popular spots, with "Berkshire locals" year round. The place where locals go to meet friends, eat and drink, or just sit back, relax and watch a game ...at Non Lenox Prices! In the summer months The Heritage Tavern has the same locals and a constant flow of tourists, many returning year after year for a great meal and a couple drinks at prices unheard of in Lenox. The Heritage is a locally owned, family operated restaurant and if you like a good burger, Monday night is Burger Night. After 5:00PM they serve one "Best Burger In The Berkshires" for only $5.99, with lettuce, tomato, choice of french fries, plus two additional topping. In addition, they feature Daily Lunch as well as Dinner Specials. The menu offers something for everyone from Wings to Salads, ...Burgers to Chicken, ...Plus Appetizers, Nachos, Soups, Sandwiches, Wraps, Quesadillas, Pizza, Steak, Salmon, Fish & Chips ...even Cajun Mahi Mahi and more! I have to say, the Heritage Clam Chowder and the Broken Ankle Wrap, which is a smoked pulled pork topped with cole slaw are a couple of our all time favorites. We've recommended both to many, and it hasn't disappointment anyone yet. Give it a try! Most of the staff has been there for years, which is usually a good sign. Our experience with service has been excellent, even when they have been exceptionally busy. In the summertime they have outside seating available and are located in the center of downtown Lenox and walking distance to most shops, boutiques and galleries. You'll find a great selection of beers, both bottled and on tap, exceptional cocktails, a nice selection of wines. KENO is also available at The Olde Heritage Tavern.